Ukuleles originated in Hawaii in the 19th Century. The ukulele is an adaptation of a Portuguese instrument called the machete, which is a small guitar-like instrument that was introduced to the people of Hawaii by Portuguese immigrants. Its popularity began to grow in the 20th Century and has continued to gain exposure in the years since. At Blues Angel Music, we’re keeping the ukulele alive. We carry the coast’s biggest selection of ukes in soprano, concert, tenor, and baritone. Prices range from around $40 and up, depending on the materials used and the quality of craftsmanship. Just like any other instrument, there are entry level ukes and professional grade ones as well. Every Saturday, Blues Angel Music hosts a free ukulele class. From 9:30 until 10:30, there is a beginner class where you’ll have the opportunity to learn some chords and strumming patterns. Before the class is over, you’ll be able to play a song or two, but it takes practice to get good. When you’re ready, you can stay for the 10:30 until 11:30 advanced jam with the Pensacola Ukulele Players’ Society. Here’s your first lesson: Standard tuning for a ukulele is G C E A. We have ukuleles from Kala, Gretsch, Amahi, Luna, Cordoba, Eastman, and more. Have a look at some of our ukuleles below. 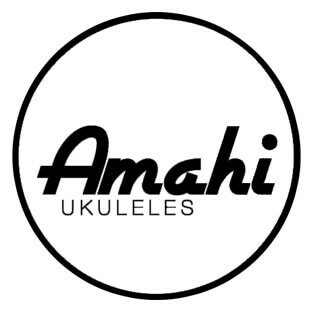 Amahi offers a diverse line of ukuleles in varying styles and finishes. Their Tropical Series is a colorful line featuring the Tropical Penguin, a group of bright, solid colored ukuleles. Also in the Tropical Series are the Rainbow Wave, the Psychedelic, the Blue Bird, and several others. The Mahogany Series is a grouping of beautiful dark mahogany ukuleles in different sizes, wood grains, and styles. The Classic Series features a broad selection of tonewoods from mahogany and rosewood to zebrawood, ebony, koa, flamed maple, and quilted ash. The Snail line from Amahi is a step above. These fine ukuleles come in a limited series of only 10 styles. They are as beautiful as they sound. The Exotic Wood Series features ukuleles made from flamed tiger maple, exotic rosewood, and African burl, among others. The Rainie ukuleles are the pinnacle of Amahi Ukulele’s craftsmanship. The 10/15 Series is Cordoba’s best selling line. It is also their entry-level line of ukuleles. All of the ukuleles in this series feature mahogany top, back, and sides. Some feature pickups and soundhole volume and tone controls. The 20 Series are also all mahogany and feature natural wood pattern rosettes and a satin finish. They come in soprano, concert, tenor, and baritone sizes. The 22 Series also come in soprano, concert, tenor, and baritone sizes, but unlike the 20 Series, the 22s are made from solid spruce tops with rosewood back and sides. These ukuleles come in a high gloss finish. The 23 Series are made with solid ovangkol top, back, and sides with a rosewood bridge and fingerboard, mahogany neck, and ovangkol headstock veneer. In addition to standard sizes, the 23 Series comes in a tenor cutaway version. The 24 Series features a solid cedar top and spalted maple back and sides. This wood combination gives the 24 Series a sound much bigger than one might expect. The 25 Series comes in soprano, concert, and tenor sizes. These ukuleles are handmade with solid acacia tops and backs. Their styling is a nod to the Portuguese machete. The 30 Series are designed by renowned luthier, Pepe Romero, Jr. They are completely handmade in the Spanish guitar making style. They feature a larger and deeper body, among other special accouterments. Blues Angel Music is proud to be the nation’s top retailer of Eastman instruments. Just like us, Eastman is dedicated to providing the highest standard of quality to its customers. They do this by using premium tonewoods and fine appointments in their full line of handcrafted instruments. From their roots in violin making to guitars and mandolins to ukuleles, Eastman is regarded as one of the finest instrument makers in the world. Eastman currently offers one ukulele line, the EU3. It is available in soprano (EU3S), concert (EU3C), and tenor grand concert (EU3T) models. Each ukulele is made with solid wood construction; the top, back, and sides each cut from the finest mahogany and finished in a high gloss lacquer. The binding and bridge are rosewood, and the fretboard is inlaid with abalone pearl snowflakes. Eastman ukuleles come fitted with a bone nut and saddle, and they’re fitted with classic Grover tuning machines. Eastman ukuleles come with a hardshell case. Gretsch now offers its Roots Collection. This is a series of instruments including guitars, banjos, mandolins, resonators, and ukuleles that “transport players to a bygone era” before electric rock and roll took over. They are classic Gretsch. The resurgence of the ukulele’s popularity meant it needed to be included in the Roots Collection. All of these instruments feature premium construction features such as quartersawn solid mahogany tops, backs, and sides; one-piece mahogany necks, and semi-gloss finishes. Available from the Gretsch Roots Collection are the concert deluxe, tenor deluxe, and the tenor cutaway electric ukulele. Each of the three ukuleles in this line come in several variations including long-neck and guitar-ukulele. There’s even a resonator ukulele in the lineup. Kala has been known for their quality and affordability. Their line offers a ukulele for every player and environment. The Kala Waterman is the perfect ukulele for our Florida beach lifestyle. They are durable and water-resistant and come in a wide variety of translucent and opaque colors. There is even a clear model. The Waterman is made with a focus on outdoor use for the outdoorsy type. It is at home at the beach, river, lake, or in your backyard by the fire. No matter where you go, the Waterman can go with you. Makala by Kala is a line of ukuleles with several designs, designated by different names. The Makala Classic is a series of classically styled wooden ukes. The Dolphin features a dolphin shaped bridge. Likewise, the Shark features a shark shaped bridge. The Makala Ukadelic is a unique and colorful line with a bit of humor and whimsy thrown in for good measure. There are tie-dye and “hippie” themed versions, an all American, and a rock-n-roll top design featuring skulls and scrollwork. The Baritone Series produces a thick, full tone. The baritone ukulele is generally tuned down to match the bottom four strings of a guitar, rather than the standard ukulele tuning of G C E A. The Concert Series has a full tone and its longer profile is better suited for people with larger hands. Their Concert Series is a great choice for everyone from beginners to professionals. This is also their broadest line. The Soprano Series is the most common type of ukulele. The smaller size makes it ideal for travel and for beginner uke players. The smaller scale also makes the soprano ukulele great for people with smaller hands – like children. The Tenor Series is a bit larger than the Concert Series, and features a fuller tone and timbre. This line of ukes is perfect for people looking for a rich tone and easy access to the upper fret register. Finally, the Tribal Series features funky tribal inspired designs on the top, and the Heartsong Series features a treble/bass clef inlay around the soundhole and a USB output for recording or live amplification.